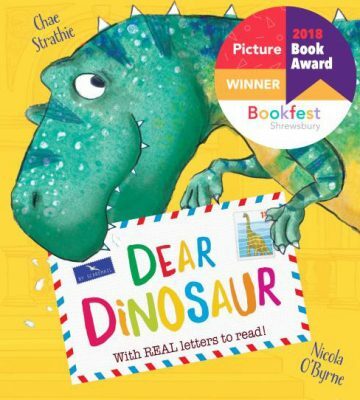 An impressively original and thoroughly entertaining picture book about a dinosaur and a 6-year-old fan with questions who strike up a lively correspondence has been chosen by children across Shropshire to win Shrewsbury Bookfest’s inaugural Picture Book Award for 5-7 year olds. Dear Dinosaur by Chae Strathie, illustrated by Nicola O’Byrne attracted the most votes in a tight finish. Pupils from Gobowen Primary School said that both boys and girls enjoyed the ‘fantasy’ aspect of this book and loved the idea of a Dinosaur being able to hold a pen and write a letter. Children also loved the fact that there were real fold-out letters, postcards, and more actually attached to the interior of the book, as well as the bright illustrations of the dinosaur doing every- day, kid-friendly activities. Over 600 children from 17 primary schools across the county took part in the Picture Book Award, delivered by the team from Shrewsbury Bookfest, during the summer term. Children in Years 1 and 2 had been tasked with choosing their favourite story, from four contemporary picture books on the shortlist, with the help of a ‘buddy reader’ system. These buddy readers were made up of their peers from Years 5 and 6 who helped the younger children read, evaluate and consider which book they liked the most. Shrewsbury Bookfest provided teachers with ideas for classroom activities based on all the shortlisted titles, as well as a teacher’s forum on the website to share thoughts and ideas. An art competition was also run alongside the reading, giving children the opportunity to express their interpretation of any aspect of any of the shortlisted books through drawing and painting. Over 270 children created beautiful artwork using paint, collage, watercolour etc. from the following primary schools: The Wilfred Owen School, St Lawrence – Church Stretton, Severndale Specialist Academy, Prestfelde, Gobowen Primary School, Castlefields Primary School Bridgnorth, Greenfields Primary School, Greenacres Primary School, Rushbury CE Primary School and Sir Alexander Fleming Primary. A team of judges awarded a winner from every school that took part. The Picture Book Award project was the latest reading for pleasure initiative produced by Shrewsbury Bookfest in response to demand from teachers in the region who had witnessed the overwhelming postive impact of the Big Book Award for older pupils aged 9-11 earlier in the year.